Are you interested in learning the Thai language? Did you know that as a women in Thailand you greet someone with “Sawaddee ka”? As a man, on the other hand, you say “Sawadee krap” when you meet somebody. In Thai, the official language of Thailand, you always have to be able to tell if you are speaking as a man or a woman. Here you can listen to the pronunciation of "hello" in Thai. You won't just get insight into Thai pronunciation. You will also become familiar with the wonderfully ornamental Thai script: Thai has been written since the thirteenth century in the so-called Thai script. This script originated in South India. Thai belongs to the Tai-Kadai language family. The Tai-Kadai family includes some 70 languages and is spread throughout the region, from China to Laos, Vietnam and Thailand and all the way to India. Thai belongs to the largest sub-group of the language family (Kam-Tai language sub-group). Thai is a tonal language. When you learn Thai, you have to learn how distinguish between and pronounce the different five tones: you distinguish between a high, middle, deep, rising and falling tone. But learning these tones won't present a problem for you because all words and phrases in our language courses have been recorded by native speakers from Thailand. The standard language of Thailand is defined from the language in and around the capitol Bangkok. Standard Thai is primarily spoken there as well as in central Thailand. Along with standard Thai there are three major dialects that more or less strongly deviate form it. As in many other countries, the dialects in the north and south of Thailand differ from one another strongly. In northernmost Thailand, the dialect spoken differs the most from standard Thai. There you will find a smooth transition between the Thai and Laotian languages. 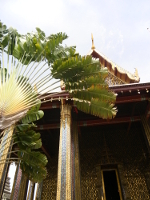 In our language courses you will learn the standard pronunciation of Thai. We are delighted by your interest in the Thai language. The BBC provides 10 interesting facts about the thai language. If you would like to learn the Thai language, go here for Thai languages courses from 17 Minute Languages.